To experience that rush of blood and the pump of the adrenalin, get behind a wheel. For those interested, India is a major venue on the international rally circuit, with quite a few rallies now established as annual events, attracting not only national level participation but also from the international level. The terrain that India provides -from the deserts to the beaches, to the mountains -tests not only the skills of the rallyists but also their mettle. 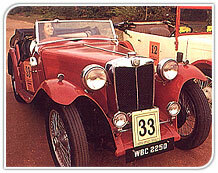 One of the more well known rallies, till about a few years back, was the Himalayan car rally, which has since been discontinued. Of recent origin are the vintage car rallies in which some very rare, collector cars are not only displayed but also run in the rally. If you're lucky, you might just spot a 1935 Jaguar convertible'or even an 1898 Humbrette.